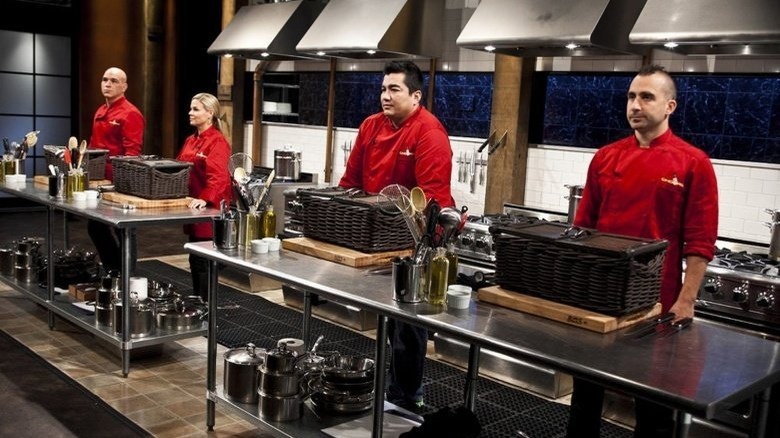 If You Don’t Have A Sob Story, Can You Win Chopped? After a long day of work on this warm Tuesday, I plopped right on the couch and went channel surfing. I scrolled right to the Food Network, which was in the middle of a Chopped marathon. That’s a W, folks. Now I could go on many tangents when it comes to Chopped. Why does Aarón Sánchez have to profess his love for spicy things every episode? Has anyone ever baked a successful cake? Why do chefs make ice cream even though it NEVER works? Anyways, I flipped on the episode and the chefs just turned in their appetizers for judgement. This guy, who I will call Matt, presented his dish. He tried to bake a pudding for breakfast (theme of the basket) but it did not work whatsoever. So he had to just put the mush on the plate and call it day. He obviously got ripped for it. However, when Matt was asked why he was there today, he broke down into tears right away, saying he used to take drugs and sell them as a kid. Good for Matt. He had a rough upbringing and he made it out on top. That’s awesome. You completely messed up your dish. Nothing is going to change that. If I was voting, I would’ve sent him home, but instead, the girl who didn’t have a compelling sob story was sent home. Yes, her flavor profiles were not perfect, but the dish was good enough to make it to Round 2. This begs the question. The right answer is no. The truth is no. No. No. No. No. No. Hey, credit to the chefs for playing up their sob stories. If that will save them when they decide to throw something in the blast chiller at the last second and it doesn’t freeze, so be it. But I think the judges have to have some integrity. Judge the chefs on the food, not their stories. If their pan seared scallops are not cooked properly, send them home. If they don’t reinvent the cow brains in the mystery box, send them home. I don’t care that they want to send their parents on a fantastic vacation to the Caribbean. If the steak is raw, it’s raw. Chop them on the spot. It’s 2018. No more participation trophies.